A new Poetry Journal devoted to promoting "rationalist poetry." 21 masters of musing, meaning and mind, proving that the left brain can reside comfortably in left-field. This published edition features poems by: Craig Broad, Glen Norris, Cameron Scott Conaway II, Holly Day, Devin Wayne Davis, Oliver Benjamin, Raud Kennedy, Laurie Corzett, Lee Ann Leung, Michael Marks, Francis Masat, Patrick McCarthy, Eva Ivonne Olson, Ravi Rajan, Thomas Reynolds, Richard Denner, Sharon Esther Lambert, Wendy Saw, Clifford K. Watkins, Jr., Rohitash Chandra, and Jeffrey Williams. For too long people have placed an artificial barrier between the rational and the poetic. Yet poetry is not only rational, it is hyper-rational - meaning that it points to knowledge beyond the known and as such acts as a beacon to seekers of the sublime. Metaphor is the language of deep thought and poetry helps to unveil the structures beneath and beyond the obvious. The flesh of most poetry is an interconnected web of metaphors, painting a picture of the unseen so that we might, if but for a moment, capture it and examine it and then let it fly away again. Poetry is said to be the language of the soul. A rationalist may not believe in the transcendent soul that carries on after our death, but no one can deny the existence of soulfulness. And though it's not commonly assumed, soulfulness is at the core of rationality. Clear thought springs from clear feeling. Our consciousness must proceed along the evolutionary channel, from reptile to mammal to man and make sense of the entire journey with each breath and reflection. Great poetry illuminates that path and helps to explain its conflicts and congruencies. Furthermore, the poetic is at the heart of all natural systems. The relationship of the parts to the whole and the difficulties and breakthroughs involved in coordinating between them and struggling "upwards towards the light" are actual lines of poetry written every day in the oldest book in the world, that is, the story of nature -- the epic verse of life itself. Poetry is not aesthetically arresting (to use James Joyce's phrase) because it is human, rather because it is more than human. It is in all things, and it is through poetry that we bond with the world around us, within us. In poetry we recognize that, despite what postmodernism has taught us, there are indeed universals in the world, and they illuminate each other through the abstract dimensional bridges of metaphor and mythos. Traditional religions drew their power from this principle. Giving flesh to poetry made the abstractions of life more palpable and easier to identify and remember. But in confusing images with the ideas they represent (confusing the medium for the message) religious architects continually stop creativity in its tracks. Poetry is fluid, ever-changing and requires continual reexamination to make sense of. Few think of science as a kind of poetry, and yet it is in many ways closer to poetry than religion because it is creative, curious and self-doubting. In science, as in poetry, nothing is sacred. When something is sacrosanct, it is off-limits to interpretation and amendment. Religion is a closed and dusty library; science and poetry are twin academies of art. 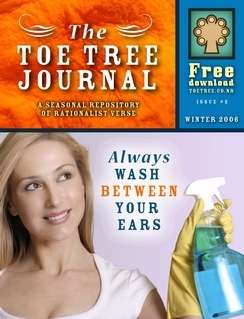 The TOE TREE is a journal of poetry that either aims to show the relationship between the rational and the poetic, deals with rational or scientific subjects, or merely helps to inspire people towards clear-seeing and rational thought. We invite all to contribute to the journal, either with original material or with excerpts from other sources (classic poetry, fiction and non-fiction books). Classic bits of poetry and prose will be featured on a forthcoming TOE TREE "Roots" page.